Polywood Outdoors supplies timeless and durable luxury outdoor furniture made from revolutionary Polywood timber at great prices. Polywood Outdoors offers timeless and classic Polywood furniture for sale online made from revolutionary polywood timber. Relax in our durable and comfortable, all-weather furniture – it will never rot whether it is exposed to rain, snow, salt water or sun. It comes with a 20-year guarantee, so Polywood outdoor furniture is built to last. If you'd like to find out more about Polywood Outdoors, please give us a call on (03) 8288 1799. If you would like to be notified of special offers and new products then please fill out the form below. Thank you! We will keep you up-to-date on Polywood Outdoors special offers and new products. If you are a resort owner or manager, part of your job is to ensure that your guests have access to a comfortable place to sit by the pool or out on your grounds. When the time comes for you to buy deck chairs and other pieces, you need to buy furniture that gives you value for your money. Our products will never rot, split or peel and offers you more in the long term than wood. If you plan to order chairs and lounges online, consider investing in the latest Polywood furniture from one of the best shops in Melbourne and around the country. WHY INVEST IN LUXURIOUS POLYWOOD FURNITURE? One thing to consider as you look at luxury designs is the overall quality and durability. You need to be sure that the products you buy are made for frequent use in outdoor conditions. An example of this might be that if you are planning to buy sun lounges, they need to be extra heavy duty in order to cater to clients of all shapes and sizes, through long days in the sun. 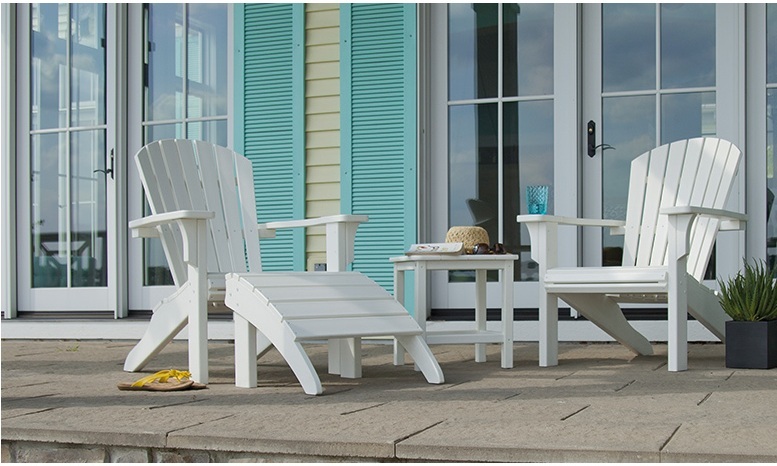 Our entire line of Polywood outdoor furniture is rated for commercial outdoor use. You can buy garden benches, deck chairs, lounges and more with confidence that they will be a great investment in the style and overall amenity of your property. We offer an outstanding 20 year warranty on all of our Polywood outdoor furniture (see our Warranty page for more information). The material we use to manufacture Polywood outdoor furniture — high density polyethylene made from over 90% post-consumer plastic — is stronger and longer lasting than anything you can buy made from wood. It looks like wood, feels like wood, but you can count on it to provide you with far better strength and durability with no maintenance. Best of all, this lumber comes in a variety of colors including red, white and blue.